It is a wide spread fact that smoking cigarettes is bad for our health. It is a vice that ruins the health so if you decide to give up smoking we will give you some facts that will make your decision even firmer. According to the statistics, after one year without cigarettes, a risk of heart disease is reduced in half and after 10 years the odds for development of a lung cancer are decreased in a half. Smoking has a lot of side effects that can lead to slowly death, because active smokers have chances of developing lung cancer emphysema and heart disease. It is proved also that smoking has effects on the liver, digestive system and gallstones so if you take a look at only one smoking side effect you can see that smoking is an enemy to our body. Female population that smokes has a risk of developing lung cancer, cancer of mouth, larynx, esophagus, urinary track, kidney, cervix and pancreas, while in the physical appearance, the teeth turn black, they have a bad smell and their face turns yellow. Breast cancer, the major cause of deaths in the world, has a better chance of developing in a woman smoker than in a non-smoker. Fertility in a woman is also endangered with smoking, because the chances of getting pregnant are reduced or if a woman is pregnant she my have complications during the pregnancy that may influence the fetus. Sudden Infant Death Syndrome and mental retardation are connected with smoking during pregnancy while children who live with parents who smoke are at risk of developing asthma, because they are second smokers. Some people refuse to quit smoking because they are afraid that they will gain a few pounds more. That is partly true but what are a few pounds more in comparison to healthy lungs and strong heart? The fact that smoking reduces a life for 12 years is astonishing. If someone is a lifetime smoker, then his lungs are barely functioning. It is because over a period of time his lungs and airways damage resulting in a chronic bronchitis. 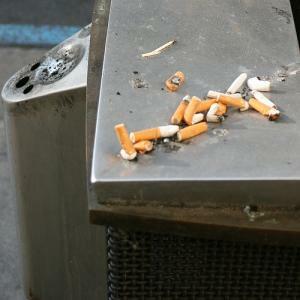 Due to smoking, millions of Americans suffer from heart disease, cancer, respiratory problems, and osteoporosis. According to the statistics14% of deliveries that occurred before time are due to smoking, and 10 % of all cases of infant death are caused by smoking. We hope that this information increased your desire to give up smoking (if you are smoker) or to help and persuade someone to give up.